Lahore, one of Pakistan’s wealthiest cities and second most populous, is home for 11.13 Million People. Having a beautiful home in one of the thriving zones of Lahore is no less than a dream. As we know that the real estate market of Lahore has emerged as a significant avenue for investment purpose. This has encouraged local and international investors to invest in the golden land of Lahore. One such eminent society that has placed its mark on the map of Lahore city is Bismillah Housing Society. This scheme is a stimulating expansion to Lahore's rural real estate. It is one such housing society that is developing to distinction. Developed by Bismillah Developers, it is a serene and one of the most beautiful lush housing societies. The project has been initiated with the aim to provide a peaceful, serene and luxurious life in the surrounding of green landscapes. 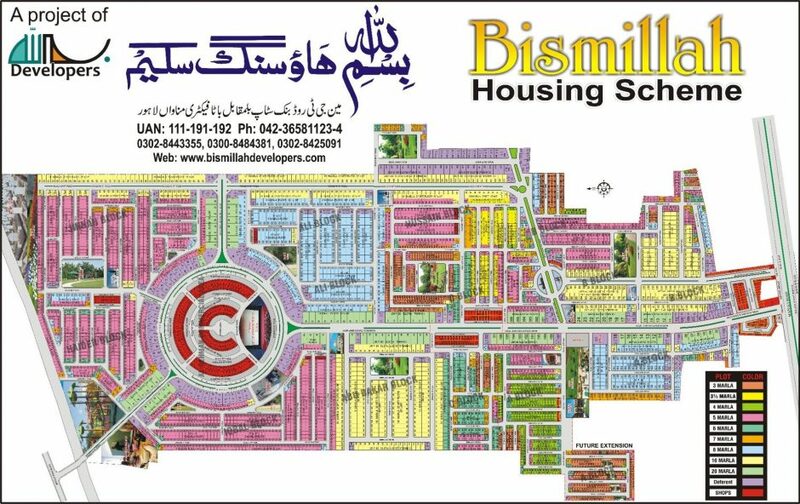 Bismillah Housing Societyis located on G.T Road Manawa Stop around Bata Factory, Lahore, Pakistan. Location of Bismillah Housing Societyis ideal as it is surrounded by schools, colleges, offices, hospitals, parks, grounds, commercial centers and top public transportation links. Just after the completion of Orange Line Metro Train Lahore, Location of Bismillah Housing Societywill become more prominent in near future. Bismillah Housing Scheme is the first ever housing scheme in its surrounding which is going to present a well-developed infrastructure which is featured with all modern day facilities and amenities. The society offers commercial and residential plots of 3 Marla, 4 Marla, 5 Marla, 10 Marla and 1 Kanal. The project has been developed with modern day infrastructure and master planned for fulfilling both commercial and residential needs. With easy installment plan, you can book the plot of your choice. The society – in only a short period – has risen to rank itself among the most prestigious housing schemes in the city. And the developers, by all accounts, really have managed to raise the bar for other schemes. With modern state of the art planning and wide carpeted roads, the developers have focused deeply upon the infrastructure. The society is also expected to get gas supply. With the provision of all the basic and modern facilities of life, Bismillah Housing Scheme is a considerable option for investment purpose.